Approximately 200 kids and adults participated in the World's Largest Swim Lesson today at Breakwater Beach Waterpark in Seaside Heights. The 24-hour event, taking place at an estimated 700 waterparks, pools and swim schools in 44 U.S. states and 29 countries, aims to teach both kids and adults the importance of water safety. "Drowning is the second leading cause of death for ages 1 to 14," said Maria Mastoris, marketing manager for Casino Pier and Breakwater Beach. "It's a fun day (where) kids and families learn how to swim, how to prevent drowning, and water safety in general." According to a press release from The World's Largest Swim Lesson (WLSL), "more drowning and near-drowning accidents take place in June than any other month and the July 4th holiday traditionally sees an increase in drowning accidents." Olympian Tom Wilkens, a bronze medalist in the men's 200-meter individual medley during the 2000 Summer Olympics in Sydney, Australia, was on hand to offer advice to those taking part in today's swim lesson. "Even Olympic swimmers have to be careful around the water," said Wilkens, who grew up in Middletown and attended Christian Brothers Academy. 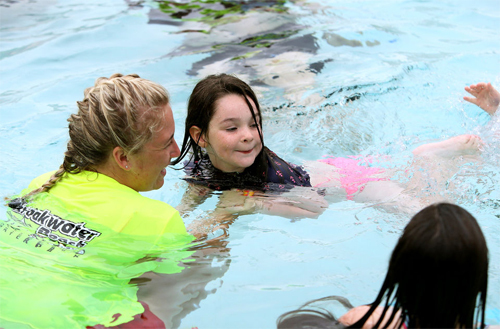 In 2010, the WLSL was created by the World Waterpark Association to "help the global aquatics industry work together to build awareness about the fundamental importance of teaching children to swim." Participation in formal swimming lessons can reduce the risk of drowning by 88 percent among children aged 1 to 4, yet many children lack access to formal training opportunities, according to the WLSL. This is the seventh year Breakwater Beach Waterpark has hosted the event, and the facility is one of nearly 20 New Jersey locations to host this year. In 2017, approximately 45,000 kids participated worldwide. The total number of participants this year will be released at a later date. Lori M. Nichols may be reached at lnichols@njadvancemedia.com. Follow her on Instagram @photog_lori and Twitter @photoglori. Find NJ.com on Facebook. Have a tip? Tell us. nj.com/tips.